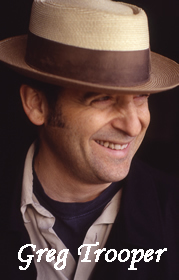 Greg Trooper is a singer/songwriter who has released 11 albums since 1986. Raised in the shore town of Little Silver, NJ he became enthralled by the greater New York area's rich music scene. He discovered a sort of holy musical trinity in the work of Otis Redding, Bob Dylan, and Hank Williams, with their guiding lights of passion, literary dexterity and plainspoken honesty. It's one reason Trooper's music feels equally informed by Memphis soul, Greenwich Village folk and Nashville twang. Trooper has made an impact on the music scenes in all the places he's lived since leaving home after high school: Austin, Texas, Lawrence, Kansas, Nashville and New York. Music critics praise his poetic feel, infectious melodies and sophisticated lyrics. Americana star Buddy Miller produced 1998's 'Popular Demons' album, while soul legend Dan Penn steered 2005's extraordinary 'Make It Through This World'. His latest release, 'Upside-Down Town,' has garnered critic's praise from around the globe and in the words of Ken Paulson "Trooper has recorded yet another impeccably written and performed album." His songs have been recorded by numerous artists including: Vince Gill, Steve Earle, Billy Bragg, Robert Earl Keen, Maura O'Connell, Lucy Kaplansky and Tom Russell.